With an experience of more that a decade, we have gained immense expertise in offering superior Plastic Household Products. Our product line comprises Plastic Storage Drums, Plastic Bathroom Sets, Plastic Containers, Soap Dishes, Plastic Mugs and Plastic Dustpans. 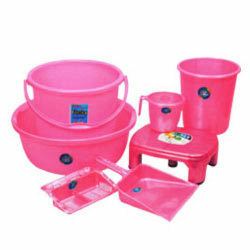 In addition, we specialize in offering finest array of Plastic Tubs, Plastic Stools, Plastic Dustbins, Plastic Table, Dish Baskets and Plastic Buckets. All our products are manufactured using high quality plastic, which is procured from reliable vendors in the market. Supported by a team of expert professionals, we have been able to offer products that are in line with changing market trends. Empowered with advanced machines and equipment, we are capable of meeting even the bulk demands of the clients within stipulated time-frame. Further, our professionals help us in offering customized products as per the specific needs and demands of the clients.